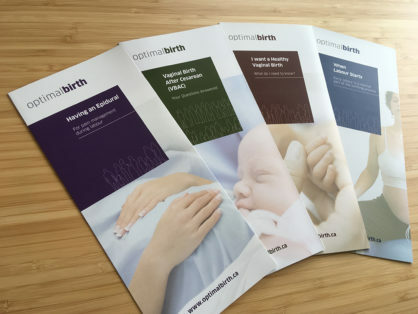 Optimal Birth BC develops information pamphlets to assist caregivers in their efforts to inform women and their families about their choices in childbirth. You can order our high quality folded pamphlets by contacting us or by filling out our online order form. Please note: Pamphlets cost $0.35 each (to cover our printing costs), plus shipping. We ship via Canada Post. Interested in complimentary copies to assess the need for these pamphlets in your practice? Please contact us. You can download any of our double-sided single page leaflets below. Describes risks and benefits of vaginal birth after cesarean (VBAC) using statistics from BC over the past 10 years. Explains what early labour is, what women can expect, what they should do, and when they should call their doctor or midwife and go to the hospital. Highlights information about prenatal care to improve the likelihood of a healthy vaginal birth and positive birth experience. Provides information about managing pain during labour and epidural use.